As ridden by Chad Smith, Australian Defence Cycling Club (ADCC). After registering for B2B last year, but not being able to make it due to an accident and subsequent injuries, I was very much looking forward to competing in the 2014 event. I booked my Defence-funded Pajero and headed to Mt Panorama in Bathurst to pick up my registration details. I got to see some of the men’s crit race that was still going when I got there – my those guys can go fast – then headed to the Kelso Hotel for my overnight stay. I readied the bike, had some sleep and headed out in the morning to catch the 0630 shuttle service to Blayney. I boarded the bus at 0610 after being just the 4th bike loaded into the transport for bikes, and was greeted with Stairway to Heaven (I had a little chuckle to myself knowing the climbing I was going to be doing that day). After sitting for about 10 minutes I noticed another ADCC uniform lining up to put a bike into the truck. He boarded the bus and with a quick acknowledgement of the ADCC kit I met Stan. We chatted a little about the day, some tactics to help us through the ride and what other rides we were planning on doing this year. 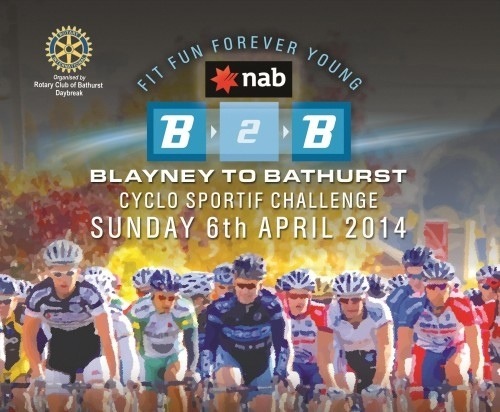 The bus arrived at the start point in Blayney at 0700, still 90 minutes prior to the start. Knowing that my bike was at the front of the transport truck I was in no hurry to run off the bus into the chilly morning air. Finally my beautiful Fondriest was unloaded. A quick check to see that nothing had been knocked out of alignment and a short, snappy ride with Stan to make sure all shifted smoothly and the long wait for the start was counting down. As I had other friends participating too I was able to catch up with a few of them and even make some plans for the ride (though these would prove to be a little ambitious for me). Stan and I got split up in the melee that is the start of 3,500 riders clamouring for a spot. But I did manage to catch up with Matthew, the 3rd of our ADCC members, prior to the start. As the 10-second countdown started to send off the Gold wave (one day I might reach these lofty heights) all the fevered anticipation of the gathered crowd suddenly silenced as the riders moved out. The setup of riders by wave seemed to work well. Stan got off in the 3rd wave (30-35 kph). Matthew and I, plus the guys from my Saturday riding bunch, were all in the 4th wave (another 30-35 kph bunch) that rolled off 20 minutes after the Gold wave. For the first 20-25 kms there was a lot of sudden braking, sudden slowing and even a crash as some people had clearly overestimated their pace, coupled with others that don’t often ride in big groups. I was caught at the back, getting very irritated by some of this and decided I was going around the slower riders being dropped in the group. I made an effort to catch the group ahead slowly pulling away, a few others followed me, including a friend, and after about 5km of chasing and not catching we settled into a nice six person group, each taking turns on the front. This was a good group, all about the same ability and everyone even having a chat. We stayed like this for around 30km until our group passed another bunch of about eight riders and we became a nice rolling 14 person bunch for approximately 10-15km until we came to a steep decent. At this point some of the bunch broke off – some of us liked the downs more than others. Then as we turned on to a slight climb (I don’t go up well) I fell off the front bunch leaving four guys to ride away and the following group to catch and pass me, including my friends who I would not see again. At the top of the climb I topped up the drink bottle at the water station and saw Matthew roll past. I rolled out of the water station alone and rode solo for around 5km, passing a few people along the way and finally caught Matthew. We rode together for the next 10 km or so. With 5km until Rockley Mount I jumped to the front of what had become a three-man group and decided to catch the small bunch ahead of us, however as we caught the little group I had a look over my shoulder to realise Matthew and our extra rider were way off the back. I had managed to drop them with out realising (I guess I was a little too zoned in on catching the others). I rode with this group of around 14-16 riders until we hit the climb up Rockley. Now Rockley is this 7.4km climb (2.4 don’t really count) and at the 5km to go point there is a sign telling you “Your Pain Starts Here.” This starts the 300 vertical metre climb that in the first 2km averages 4% with a 14% kick in it . The second 2km averages 7% with some 10% pinches (there is another km in there but it’s really just some flat and down sections). They have boards on the side of the road that tell you how many more km to go to the KOM and as I was nearing the top of the climb I could really feel the lactate building in my quads. I was very close to getting off the bike until I saw a sign saying KOM 200 meters. I willed the legs to stomp the peddles trying to get out of the saddle and “dance” very awkwardly to the top. In getting there I felt a big sense of achievement and was very happy to not have stepped off the bike. There is a cheer from the volunteers (where do they all come from?) and they then tell you that there is a water and feed station just around the corner. I rolled into the feed station, had half a banana, a bite-sized Mars bar and refilled my water bottle for the final 20km to Bathurst. While the last 7.4km took me almost 28 minutes to climb, the next 7km took me about 8 mins, at one point my Garmin told me I had hit 80.6kph down the hill and I wasn’t even peddling. Surely there is a race somewhere that I can do that goes only down and flat? As I reached the base of the decent I caught up with a small bunch of four people and we rolled along nicely, slowly passing and picking up other riders that wanted some shelter from the wind that had started to pick up. 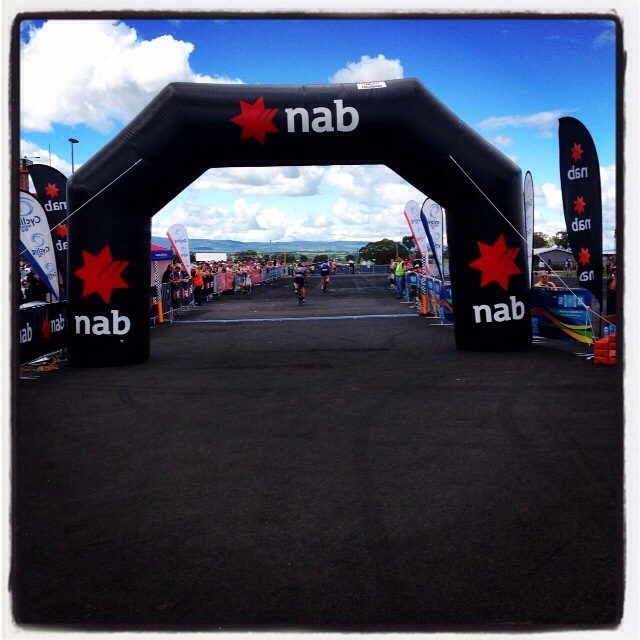 Around 10km from Bathurst I felt that all knowing twinge on the inside of my right leg. This slowly increased in intensity until I had to stop and stretch it out. I was a little peeved as I was really enjoying the final push with the bunch, but luckily it only took a couple of minutes and I was able to join another bunch that was rolling along a little slower. As we came into Bathurst some of the bunch decided to push harder until the end. I was just happy to roll along until the finish. As a cruel punishment you still have to climb past the Rydges Hotel up a small climb within sight of the finish, you then roll down the far side to the tunnel crossing and have another climb that, if you aren’t ready for in a nicely spun up gear, can cause some pain. I had been forewarned by friends to expect this so I was in a nice high gear, but as I climbed up this last little hill there were two different people on the roadside in various poses that Van Gogh would have had trouble painting. I rolled down through the camping/parking area, into the pits, past the pit complex and into the finish area, took out my phone and took a photo of the finish line as I crossed. 3 hours 35 minutes. B2B done. It was a painful climb. An excellent day for weather. A well-run event with plenty of local and volunteer support – a ride I would recommend to anyone looking for something fun to do on a Sunday. Good article Chad. Well done.